YOU ARE BUYING 1 BOX OF RAUPLATE 20 ITEMS TO A BOX FOR A TOTAL OF 80 FT OF PLATE. HERE IS THE DEAL OF THE CENTURY AND IS THE MOST IMPORTANT PART OF INSTALLING YOU IN FLOOR HEAT SYSTEM BETWEEN YOUR JOISTS. THIS IS THE MOST EXPENSIVE PART OF YOUR IN FLOOR HEAT SYSTEM BUT THE MOST IMPORTANT. IT DISPERSES THE HEAT EVENLY AS THE PLATE ARE MADE OF ALUMINUM. IN CAN INCREASE EFFICIENCY UP TO 40 PERCENT OVER OTHER APPLICATIONS. DO NOT BE FOOLED BY CHEAPER THINNER PLATES ON THE MARKET. OTHER PLATES ONLY HAVE ONE CHANNEL OR HAVE GROVES IN THE PLATES FOR THE PEX TUBING. THESE SYSTEMS TEND TO VIBRATE AND MAKE NOISE DUE TO THE POOR DESIGN. REHAU RAUPLATE IS DESIGNED TO SECURELY HOLD THE PEX TUBE IN PLACE WITH EASE OF INSTALLATION MAKING IT A QUIET SYSTEM WITHOUT VIBRATION. HERE IS A EXAMPLE OF WHAT THIS PLATE CAN DO FOR YOU. I JUST INSTALLED RAUPLATE IN MY BATHROOM WITH TRAVERTINE STONE TILE AND RAN OUT OF RAUPLATE TO USE IN A 8 FT SECTION. WHEN I WALK ACROSS THOSE TILES THEY ARE ICE COLD TO MY BEAR FLOOR COMPARED TO WHERE THE RAUPLATE IS INSTALLED IT SEEMS TOASTY WARM. WOW WHAT A DIFFERENCE. DONT CHINCE OUT ON THE MOST IMPORTANT PART OF THE JOB. New RAUPLATE Joist Space Radiant Heating System from REHAU Facilitates Rapid Installation Under Existing Floors The new RAUPLATETM joist space radiant heating system from REHAU facilitates more rapid and efficient installations without disrupting an existing floor. RAUPLATE double-channel heat transfer plates are affixed to the underside of the subfloor, eliminating the need to change or add height to the existing floor above. With one pipe channel on each edge, the pre-drilled heat transfer plate design easily and securely clips in two runs of 1/2-inch RAUPEX® O2 Barrier pipe. The aluminum plate offers excellent conductive properties and even radiant heat output to the floor above. When combined with fixing rails, RAUPLATE keeps a firm grip on the pipe, reducing expansion noise in the joist space. 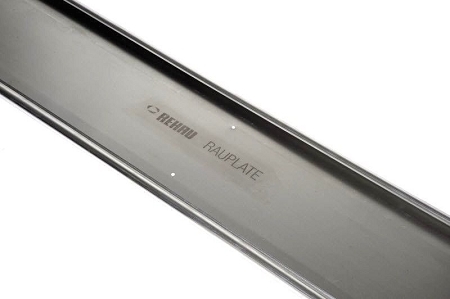 RAUPLATE™ heat transfer plates are used in radiant floor heating systems to efficiently and evenly distribute the heat from the RAUPEX pipe into the room above. Plates are installed below the subfloor in the joist space of a wood frame structure. 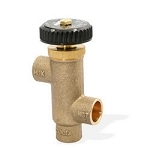 RAUPLATE™ securely holds two pipes at 8 in (20 cm) on center which is well suited for many residential new construction and retrofit projects. RAUPLATE™ System Components 1. RAUPLATE joist space heat transfer plate 2. RAUPEX O2 Barrier pipe 3. 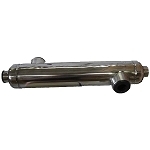 Pipe fastening rail 4. Protection sleeve RAUPLATE™ double-channel heat transfer plates screw to the underside of the subfloor. The RAUPEX pipes then clip easily and firmly into place, providing heat to the space above. RAUPLATE™ is more efficient than using tubing alone, and is easier to install than other plate systems Warranty This unit comes with a lifetime warranty against manufacturer defects. A copy of the warranty can be obtained by written request to: Anderson Outdoor Wood Furnace Center N5526 Hwy 57 Plymouth, WI 53073 Service We offer service even after the sale! 7 days a week! Over 10 years experience! This is all we do, so give us a call and let our knowledgeable staff help you. Tired of talking to dealers and sellers who don't even know their own products? Unlike others, we service what we sell! Our feedback is earned! Shipping Fast shipping! We ship immediately at time of payment or if after UPS has already picked up for the day, we will ship it out the next business day UPS ground. Our product is shipped fully insured and properly boxed from the manufacturer to insure safe arrival at your home. Free shipping is only offered to the lower 48. Canada pays shipping price listed under the “shipping and payments” tab. All others must call for a quote. Thank You We just want to take the time to thank your for the opportunity to service you and your project! We enjoy answering questions and helping your project run a little smoother! Do not hesitate to call us with any questions or concerns! Call Connie at 920-838-1764 or Heather at 920-838-4205 if needed. Thank you!